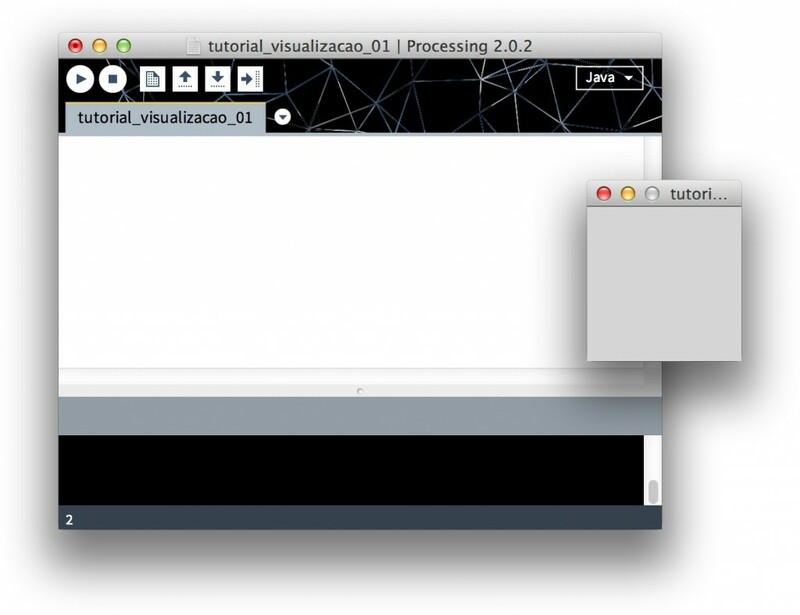 Originally created as a tool to teach programming to visual artists, Processing language now has applications in several areas, including data visualization. Its simplified syntax is a good alternative for beginners to the coding world, and its development platform can be downloaded for free online. When you open the program, you will find something like a text editor. That’s where we will type commands – no, there is not a “toolbar” here, since the original goal of Processing is to teach programming fundamentals. To run the script that we are going to write, just click on the play button at the left top corner of the window. A new window will open, empty for now, since we haven’t created any commands yet. Close it (or press the stop button) and save your file before you start programming – by default its name is the creation date, but you can choose any other name. It means that it’s possible to translate the second line as “draw an ellipse 400 pixels from the left edge and 100 pixels from the top, 100 pixels high and 100 pixels wide”. Try to change these numbers to better understand how they work. we always need a ; after each command. It doesn’t matter if you have a space or a paragraph between these symbols, but they must be there! You will find instructions for each one on the Processing reference web site. Our intention, however, is simply to present a direct visual and intuitive comparison of the theme: more points, more people; larger square, the larger area. In choosing one or another way of visualizing, always think about the balance between these two variables and analyze how they can work best according to the purpose of your chart. We will use data from the 2013 Demographia World Urban Areas to draw a graph ranking the 10 most populated cities in the world (table 1). A simple and practical data format that can be read in Processing is the tsv (tab-separated values). Basically, it is a text format that works like a table, with values ​​separated by tabs instead of cells. Transferring data from a PDF file into a table is not always an easy task, since the breaks hardly follow the format of the cells that we need. Windows: Use Notepad and save the file as “cidades.tsv”. Mac: Use the Text Edit. Press command + shift + T to transform the file into unformatted text. When you save, select Unicode (UTF-8) in the encoding option. // Loading the file into a table. “header” means that the first line of the file should be understood as a header. // It draws a rectangle at position y 50 and x according to the formula “120 times counting”. // It means that, in the sequence, coordinate x will be: 0, 120, 240, 360 … to 1080. The picture above makes the cities look much different in area than they really are, a distortion caused by the confusion between linear dimension (height and width) and size(square area). float means that this variable can store a fractional number, since we do not know if the result of the formula “root area” will be a whole number. With this, we draw 1 point for every 5,000 inhabitants (not 1 to 1). In the end, comparisons are obvious: Tokyo and New York are the cities with the largest area, but their population density is much lower than cities like Manila and Karachi. To save in another format such as tif or png, , simply change the file extension in the code above. Programming for the first time can sound like an unfriendly task. However, as you start to understand the logic behind the commands, to deal with several languages ​​is just a matter of learning different syntaxes, some are more similar than others. It is similar to speaking several languages​​. Even though the work is hard in the beginning, you will see that the advantages are worth it: in the case of the file that we used, for example, you can simply change the .tsv data to generate a different version of the view, without having to make manual adjustments to the image. In addition, programming should be understood more as a language than as a tool: instead of pre-defined resources, you can build the graph how you want it to better fit your data. The possibilities are endless. Take a look at this example file and try to change a few parameters to customize it: background color, size, space between areas etc. From there, explore the Processing reference page and try to redo this example using another type of visualization, such as bars or lines. I’m a graphic designer in love with numbers. I am currently enrolled in the Master of Fine Arts – Design & Technology program, at Parsons The New School for Design. My last job was as a senior designer for the Innovation in Technology and User Experience team at Itaú, the largest private bank in Brazil. For the past 6 years, I have been working with information and graphic design, mainly in magazines, and have won some awards. I have been invited as a speaker for some major events, including Campus Party, World Information Architecture Day and Pixel Show, the Brazilian largest conference on art and creativity. I also ran workshops on data visualization using the Processing programming language.